Matt and I are suckers for an Easy Baked Chicken Wings recipe any night of the week. We could eat wings every day for the rest of our lives and be blissfully happy. We've taken a classic flavor, Garlic Parmesan, and given it an undeniably delicious twist - bacon! Not only are there strips of bacon alongside your perfectly crisp wings, but we also use the bacon drippings in the sauce that coats them! Taste aside, these wings are beautiful, from the glistening butter coating to the fresh green parsley! Watch Matt make them below. Matthew has come up with a simple, but guaranteed crispy wing cooking method and the secret is baking powder. We used to just pat meats dry with paper towel prior to cooking, however coating the wings in baking powder and cooking at a low temperature for half the cooking time ensures you get the crispiest wing every time! After the first 20-30 minutes, you crank up the oven temperature to finish them off before tossing them in your favorite seasonings! Types Of Wings: It's All About The Seasonings! Knowing how to bake a crispy wing is definitely essential, but for me, it's all about the seasonings. For these wings, Matt broke down how simple it is to make a buttery, garlic Parmesan coating in under five minutes. Adding the bacon was a our special touch and although we highly recommend it, feel free to add your own twist! If you're looking for other ways to dress up your wings, check out our Asian wing sauce for seasoning and low carb peanut sauce for dipping! You can never go wrong with wings for dinner, especially when they are this easy to make. We've given you our favorite flavor, but the possibilities are endless. The Garlic Parmesan are pretty self explanatory, but feel free go heavier on the Parmesan, parsley, or butter. Toss on more bacon, add some chili powder for a kick, or even roast whole cloves of garlic alongside the wings. If you're stumped on what to make for dinner tonight, make these easy baked chicken wings because you can never have enough! 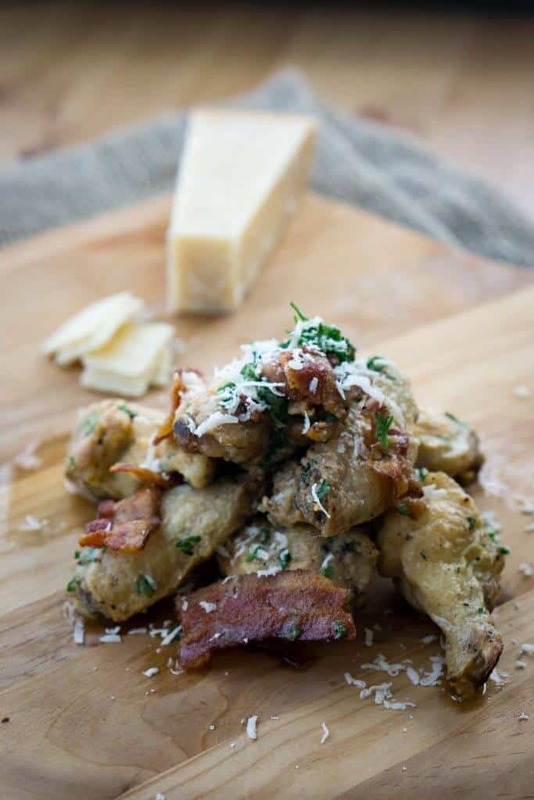 Recipe can be quickly added to MyFitnessPal - Search "KetoConnect - Garlic Parmesan Wings"
Easy Baked Chicken Wings | Two Ways! Pat the wings dry (and break them down if you want) and add them to a ziploc bag. Add the baking powder and salt to the bag and shake the wings around coating them thoroughly. Lay them out in an even layer on a baking rack on a baking sheet and place them in a the oven for 20 minutes. Turn the heat up to 450 and cook for an additional 30 minutes until browned and crispy. Cut each slice of bacon into thirds and cook in a skillet. Set aside. Add the bacon drippings and butter to a small saucepan and heat until butter has melted. Add in the salt and pepper, combine and remove from heat. Place the cooked wings and cooked bacon strips in a large Tupperware. Add the parsley and Parmesan and pour the butter sauce over the wings and bacon. Close the container, and shake until all the everything are fully coated.